Feeling the urge to upgrade your PC? We don't blame you, as there are now literally dozens of eye-catching CPUs to choose from. Core i3, Core i5, Core i7, Core i9, Ryzen 3, Ryzen 5, Ryzen 7, Ryzen Threadripper... take your pick, there's a solid choice in all of those segments and something for every price point. This week's arrival of the eighth-generation Core i7-8700K means that the spotlight has returned to the sub-£400 arena. This is where a great many high-end users choose to do their business, and Intel's latest is up against stiff competition from the likes of the AMD Ryzen 7 1800X. Both are fantastic chips in their own right. Core i7-8700K offers high IPC and six cores for £360, while Ryzen 7 1800X touts solid IPC and eight cores at a revised cost of £390. Each carries a 95W TDP and requires a new X370 or Z370 motherboard, and though you can't really go wrong with either, it's always interesting to hear on which side of the fence our readers would choose to land. 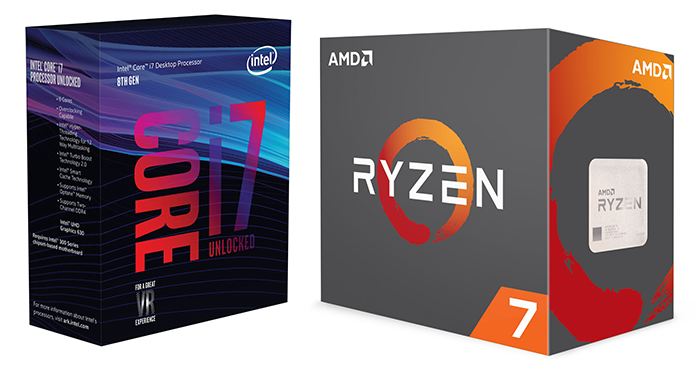 So without further ado, let us ask: Intel Core i7-8700K or AMD Ryzen 7 1800X? Let us know your preference, and your reasons for or against, using the comments facility below. The AMD Ryzen 7 1800X wins by default. The Intel i7-8700k is out-of-stock everywhere. I'd go with AMD just because there'd be no need to replace the motherboard in the next six months, the Z370 chipset is nothing more than a 200 series with modified power circuitry to support a Kaby-lake CPU with a few extra cores. Neither thanks. Not because the CPUs aren't good, they're both great performers, but because both platforms are utterly gimped for anyone who wants 16X for the GPU, an 4X M2 and have one or more additional cards which needs 4X or better.